When still outside, the visitor can see the mosaic of the woman bathing with swans above the entrance to the “Merkel’sche” swimming pool and is given an idea what this building represents. Inside, the visitor experiences the whole splendour of an art deco gem, which is almost unique in Germany. 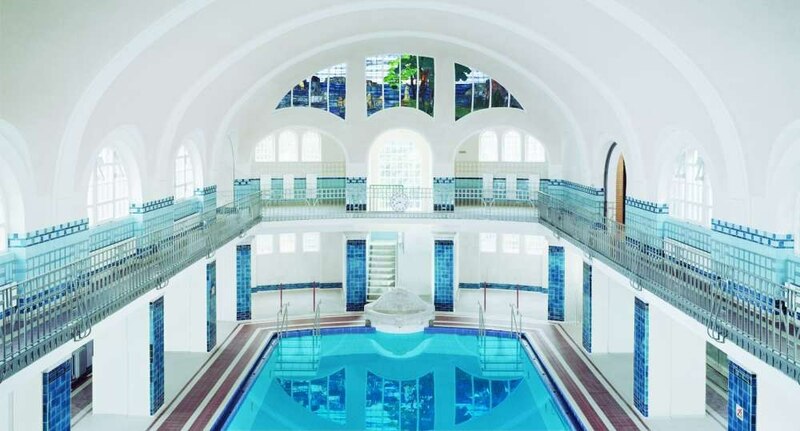 In the pool area beautiful original windows, columns, fountain figures and tiles have retained their old grandeur. Even today, visitors can dive into the splendour of the “bathing temple” built at the turn of the century. The pool was presented to the town and its citizens in 1907 by the factory owner Oskar Merkel. On the occasion of its 100th anniversary the swimming pool was lavishly renovated and a modern spa area was created on the roof terrace.